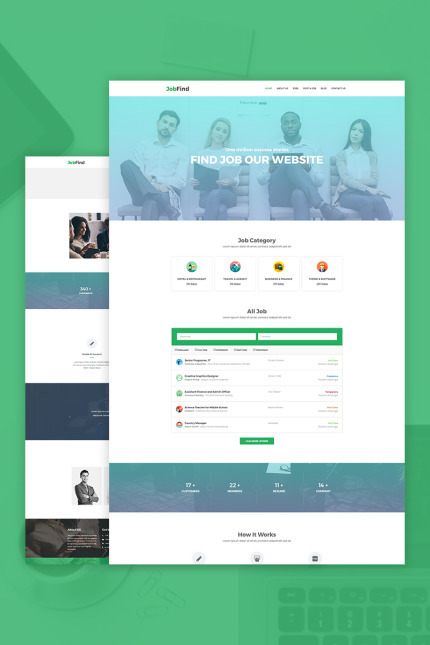 Job Find - Job Board WordPress Theme is creative and beyond the trend WordPress Theme. Job Find is to set up the online homes or websites for Job Finding, Job Circular, Job Searching, Part Time Job, Publishing Blog and all other things related to getting and providing job. Job find is a versatile creation with numerous pre-made homes and other pages. This theme brings 3+ Home Pages and a total of 15 HTML Pages. Along with the Neat, Clean and creative design Job Find has responsive layout. Besides, it comes with Cross-Browser Optimization, Well Documented CSS Files, Bootstrap, Drop-Down Menu, Sticky Menu, Mobile Menu, Elementor Page Builder, Contact Page, Google Font and many more. In addition, Job Find is exclusive for its user friendliness and function-richness. Job Find contains Jobs, Post a Job, Job Dashboard, Candidates Direct Search, Auto Job Approval, Job Based Search, Title Based Search, Job Status and company listing. Thanks to the designers that, this theme has every aspect in a superb Outfit and best User Experience. Well managed Documentation and free Updates will facilitate you greatly. Install Job Find now and make a trustworthy platform for the job seekers and the employers.